It's Homecoming Weekend here in Oxford, and what better time to reminisce fondly about years past. 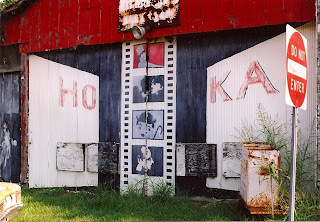 And without question, the college experience of many an Ole Miss alum was colored by nights watching cool movies and eating cheesecake (and/or hot fudge pie) at Ron Shapiro's Hoka Theater. Just across the street from what is now the Powerhouse Community Arts Center, the dearly-departed Hoka (demolished in 2007) holds a special place in many an Oxonian's heart, both past and present. Join the Oxford Film Festival TONIGHT (Friday, October 3) as we look back on the Hoka's past with an encore screening of Joe York's documentary short, SORRY WE'RE OPEN, winner of "Best Mississippi Film" at the 2008 festival, as well as his latest project, EAT OR WE BOTH STARVE, about Taylor Grocery's Lynn Hewlett. Choose a screening, 7:00pm or 9:15pm, pay $15 at the door to benefit the upcoming festival, and enjoy pizza, soft drinks, and beer from our generous sponsors: Square Pizza, Papa John's, and Power 92. Doors open at 6:00pm. Reminisce, or see what all the fuss was about.